It’s time for Sonderling Sunday! That time of the week when I play with language by looking at the German translation of children’s books. 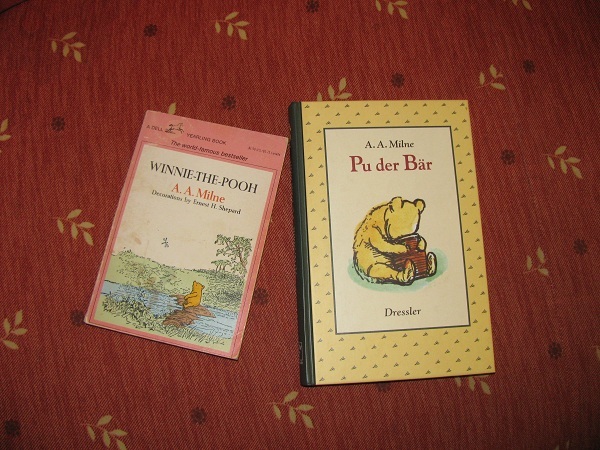 Tonight I’m continuing a look at Winnie-the-Pooh, otherwise known as Pu der Bär. Last week, I began Chapter 5, “In Which Piglet Meets a Heffalump,” In welchem Ferkel ein Heffalump trifft. We left off on page 63, Seite 69. Piglet has dug the Very Deep Pit, and Pooh has placed the bait of honey in the Cunning Trap. = Und Ferkel trabte zu seiner Wohnung BETRETEN V, während Pu seine Vorbereitungen für das Ins-Bett-Gehen traf. Und jetzt ist er mir durchgebrannt. Wo kann er hingegangen sein? = Das kommt alles daher, dass man versucht Heffalumps gut zu behandeln. = Je mehr er zu schlafen versuchte, desto mehr konnte er nicht schlafen. = Konnte es Schweine überhaupt ausstehen? “Oh, dear, oh, dear, oh, dear!” = Owei, owei, owei! “a Horrible Heffalump!” = ein unheimliches Heffalump! = Hilfe, Hilfe, ein unheffliches Heimalump! = Heim, heim, ein heffunliches Hilfalump! = Heff, Heff, ein lumphässliches Limpfahump! = Ach Bär! Wie sehr ich dich liebe! Now you know how it sounds when you meet a Heffalump and you try to report it in German. It’s time for Sonderling Sunday! That time of the week when I play with language by looking at the German translation of children’s books. Tonight I’m looking at Winnie-the-Pooh, otherwise known as Pu der Bär. Last time I looked at Winnie-the-Pooh, we covered chapter 4, in which Eeyore loses his tail. This week, we’ll look at Chapter 5, “In Which Piglet Meets a Heffalump.” The German chapter title is In welchem Ferkel ein Heffalump trifft. = Man sieht sie nicht oft. The number here is 160. It doesn’t seem to have to do with the conversion to square meters. = Falls du verstehst, was ich meine, Pu. = Genau das finde ich auch, Ferkel. = Aber andererseits, Pu, müssen wir auch daran denken. = Sehr richtig, Ferkel, es war mir nur kurz entfallen. “very solemn voice” = sehr feierlicher Stimme. = Ich habe beschlossen ein Heffalump zu fangen. = Das ist es nämlich. Wie? = Es würde Verdacht schöpfen. = Es ist nicht so leicht, wie ich dachte. = Es ist Honig, bis ganz unten. = Und has du vielleicht Bindfaden? = Heffalumps kommen, wenn man pfeift. = Manche kommen und manche knommen nicht. Bei Heffalumps kann man nie wissen. And this chapter is longer than I realized. Translating it ist nicht so leicht, wie ich dachte. I will come back to this chapter the next time I do Sonderling Sunday. I’m leaving off right where the Very Deep Pit has been dug and the Cunning Trap is set. The actual meeting with the Heffalump, I will save for next time. Meanwhile, this chapter had lots of Handy Phrases to try to work into your conversation. Gar kein Zweifel. It’s time for Sonderling Sunday! That time of the week when I play with language by looking at the German translation of children’s books, or, in this case, the English translation of a German children’s book. 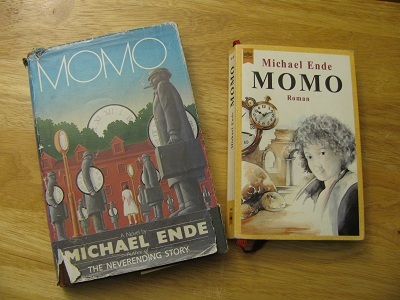 Today I’m going back to Momo, by Michael Ende, the first book I purchased in Germany — and the first chance I got, too. Last time I looked at Momo, I left off at the start of the Viertes Kapitel (Chapter Four). 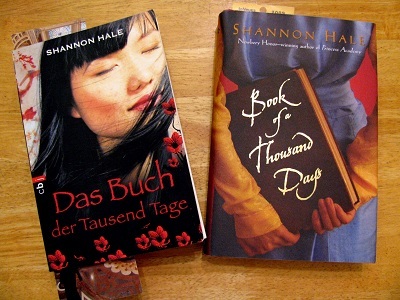 Since German is the original language, I’ll begin with the German version. Wenn jemand auch sehr viele Freunde hat, so gibt es darunter doch immer einige wenige, die einem ganz besonders nahestehen und die einem die allerliebsten sind. Man muß nur an den nächsten Schritt denken, an den nächsten Atemzug, an den nächsten Besenstrich. Aber Momo hatte ihn lieb und bewahrte alle seine Worte in ihrem Herzen. And I’ll stop there tonight. I think the most interesting word tonight was zungenfertiger. May your tongue be ready! 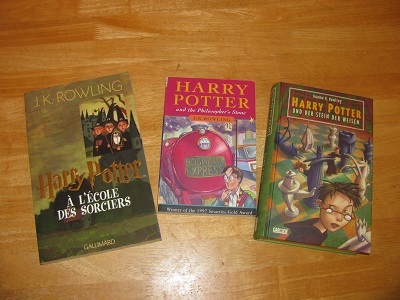 Now, I have multiple editions of Harry Potter and the Sorcerer’s Stone — including American English, British English, German, French, Bulgarian, Hebrew, Chinese, Japanese, and Czech. However, the only one I have a hope of reading besides English and German is French — so I’m going to add in the French translations of notable phrases alongside the German. This goes more slowly than just doing two languages. 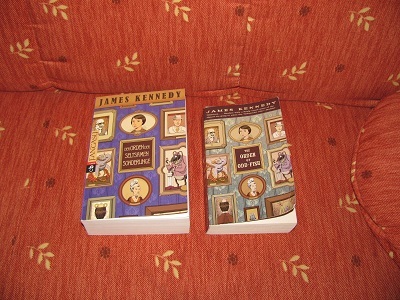 So last time I tackled Harry Potter, I only finished the first section with the Dursleys. 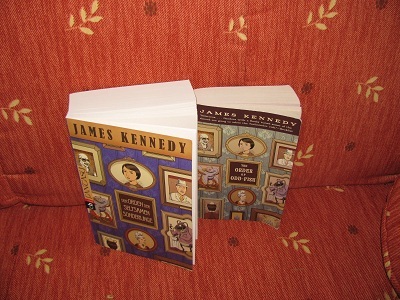 We are on page 12 of the British edition, page 8 of the American, Seite 12 of the German, and page 12 of the French. = Mr. Dursley mochte in einen unruhigen Schlaf hinübergeglitten sein, doch die Katze draußen auf der Mauer zeigte keine Spur von Müdigkeit. = Tandis que Mr Dursley se laissait emporter dans un sommeil quelque peu agité, le chat sur le mur, lui, ne montrait aucun signe de somnolence. I’m going to stop there, after the lemon drops. It takes longer in three languages! Although I took French in high school, it’s very rusty, and I had to use Google translate to be sure I’d grabbed the right words out of the text. I wish I had learned the words for Shooting Stars before the meteor shower last week. As it is, it may be tricky to find reasons to use these words this week…. It’s time for Sonderling Sunday! – That time of the week when I play with language by looking at the German translation of children’s books. 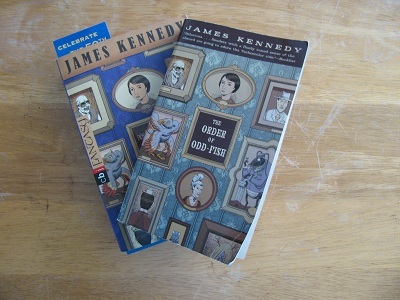 This week I’m back to the book that started it all, Der Orden der Seltsamen Sonderlinge, otherwise known as The Order of Odd-Fish, by James Kennedy. = Die Regenzeit schlug diesmal hart zu. That’s the first section of Chapter 21. It’s short, but I’m going to call it a night and do some schmiegen.